God felt sorry that He chose Saul to be king over Israel. Samuel obeyed God and went to Bethlehem to offer a sacrifice to Him. When the town leaders of Bethlehem saw Samuel, they were afraid. Samuel replied, “Yes. I have come to offer sacrifices to God. Everyone is invited to the sacrifice.” Samuel also invited Jesse to take part in the sacrifice. Jesse had all his seven sons went to Samuel but none of them God had chosen to be king. Jesse sent message for David to come. David is a healthy and handsome boy.David’s eyes have sparkles. 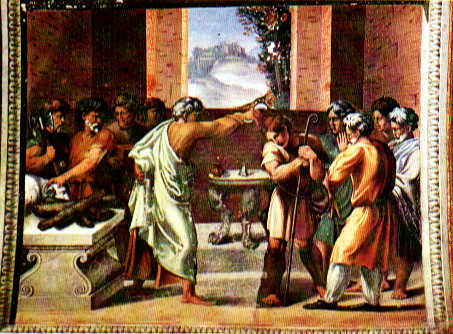 Samuel poured olive oil on David’s head to anoint him. At that moment, the Holy Spirit took control of David and he stays with him from then on.